We use windows images from cloudbase. The image comes configured with cloudbase-init. This is similar to the cloud-init system we use for linux-based instances. The images also comes with RDP enabled. The images comes with the Windows Administrator user. In order to enable this user, the password must be changed by accessing the instance console (e.g. from the Horizon dashboard). Generally, we recommend leaving the Administrator user disabled, and instead using Cloudbase-init to generate an admin user. Cloudbase-init generates an user named Admin. The Admin user is added to the Administrators group. Under the Compute > Access & Security menu, select the "Key Pairs" tab, press "+Create Key Pair". Give the key pair a describing name, for instance "windows-passwords". Press "Create Key Pair". A file called windows-passwords.pem should be dowloaded to your computer. Take good care of this file as it is used to decrypt your admin passwords. You create a Windows instance in much the same way as any other instance, by selecting one of the windows images under the Source menu. In the "Key Pair" section of the "Launch instance" dialog, select the key pair "windows-passwords" you created earlier. After creating the instance, locate it (under Compute > Instances) and click on the related pull-down menu. Select "Retrieve Password". Under "Private Key File", select "Choose file" and select the .pem file you downloaded earlier. Click "Decrypt Password". The password should show up in the "Password" field. nova get-password winbox1 ~/keys/windows-passwords.pem - where winbox1 is your windows instance and ~/keys/windows-passwords.pem is the private key file from the key pair you generated earlier. 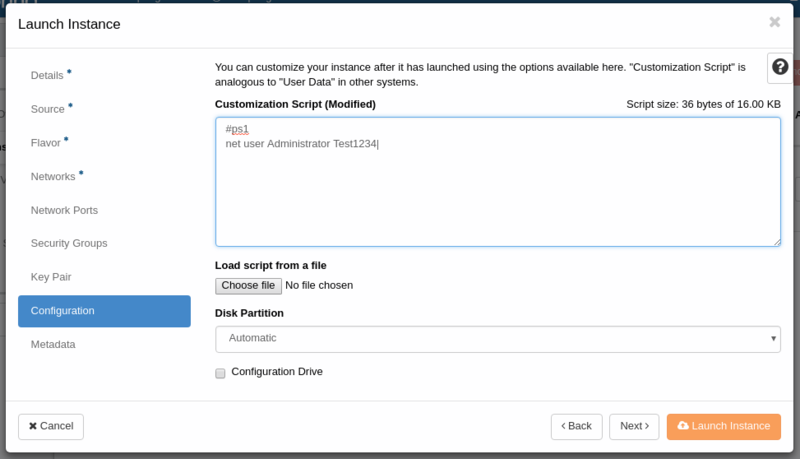 Cloudbase can run powershell scripts under instance creation. This can for instance be used to set the Administrator user password. The script can either be written directly into the "Customization Sctipt" field under "Configuration" or uploaded as a file in the same dialog box. For some reason it seems impossible to set the password for the "admin" user using this method, although setting it for "Administrator" seems to work just fine. Basically anything that a user in the Administrators group can do via powershell should be able to run via this method. The full cloudbase documentation is available online.